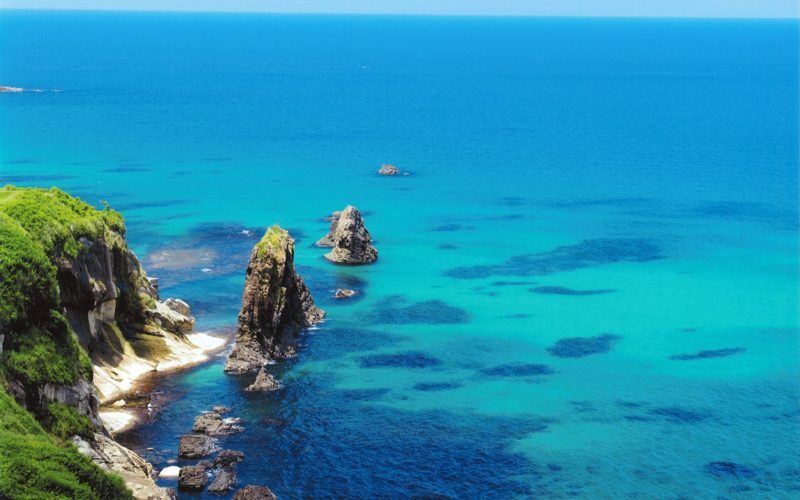 Imamiya Shrine dates back over 1,000 years, and is dedicated to good health, longevity, and recovery from illness. 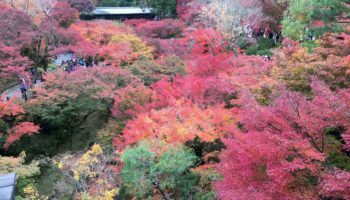 Tucked away in the north-west of Kyoto City, it remains pleasantly tourist-free despite its long history, interesting features and fun festivals. 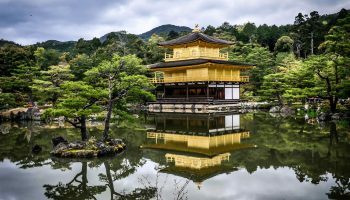 Originally located on Mount Funaoka, the shrine was moved to its current position in 1001 after a plague swept through Kyoto City. The main entrance is marked by a striking two-storied red wooden gate, which is guarded by two stone lion-dogs. 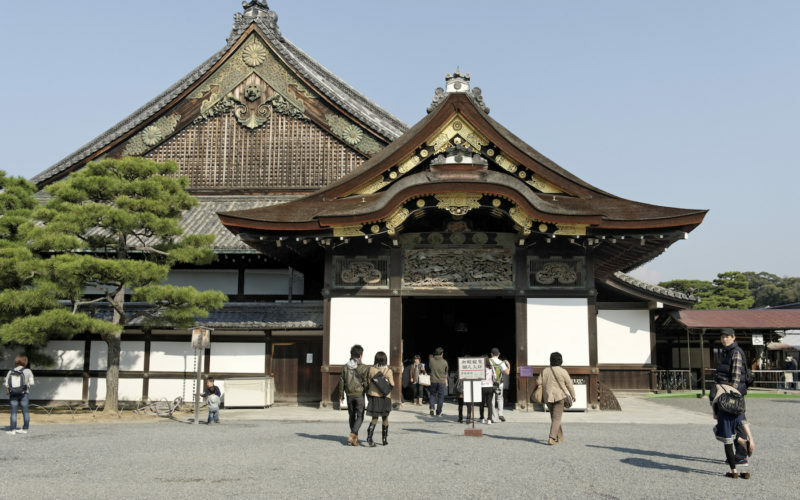 Once over the threshold, you’ll find the main hall and a number of smaller sub-shrines dotted around the small, peaceful complex. Photo by: Ashley Owen Inside Imamiya Shrine. 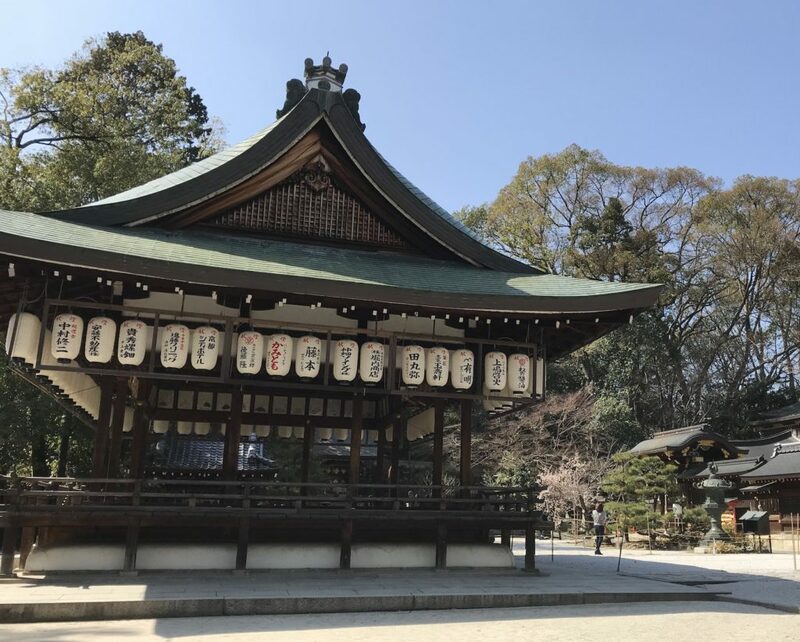 Imamiya Shrine is host to a number of lively festivals during the year, including the Yasurai festival in April, which is held to pray for good health and the prevention of illness. 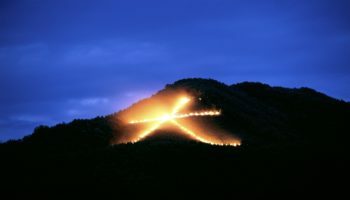 There’s also the Imamiya Festival, which lasts for about 10 days in May, and the two-day Autumn Festival in October. 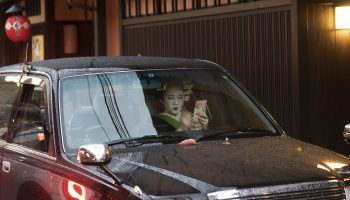 All contain a mixture of parades, dancing and music, and are definitely worth checking out if you’re in Kyoto at this time of year. As you walk around the grounds, one of the things you’ll spot is a small wooden structure that houses a rather strange sight: an ordinary-looking stone nestled regally on a silk pillow. This stone is known as Ahokashi-san, and it’s believed to possess magical properties of wish fulfillment. Visitors are invited to first tap the stone lightly three times, then lift it up. Put the stone back down and pray/make your wish. Afterwards, rub the stone three times and lift it once more. Supposedly, if it feels lighter the second time, your wish will come true! Some believe that Akohashi-san also has healing powers. By touching the stone and then touching the part of your body that is injured, it is said that your wounds will heal faster. 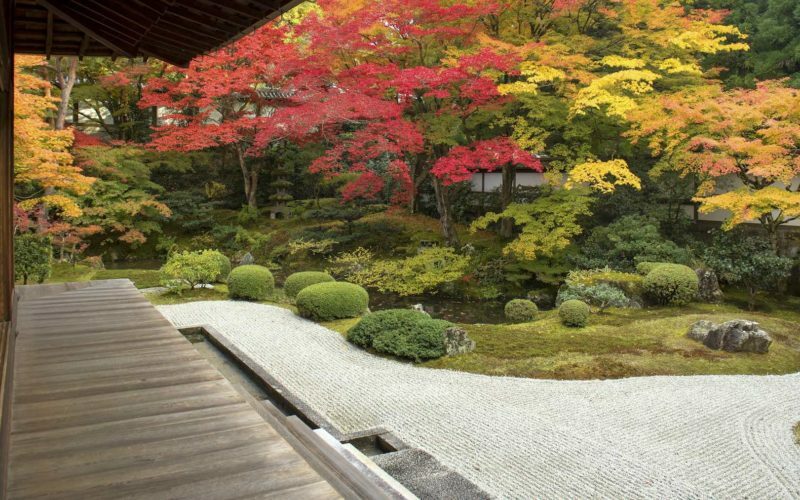 Just outside the eastern gate of the shrine, you’ll find two famous tea houses – Ichiwa and Kazariya. Kazariya was founded in 1656, while Ichiwa has been in business for over 1,000 years. Both shops specialize in aburimochi. Photo by: Ashley Owen Aburimochi during tea time. 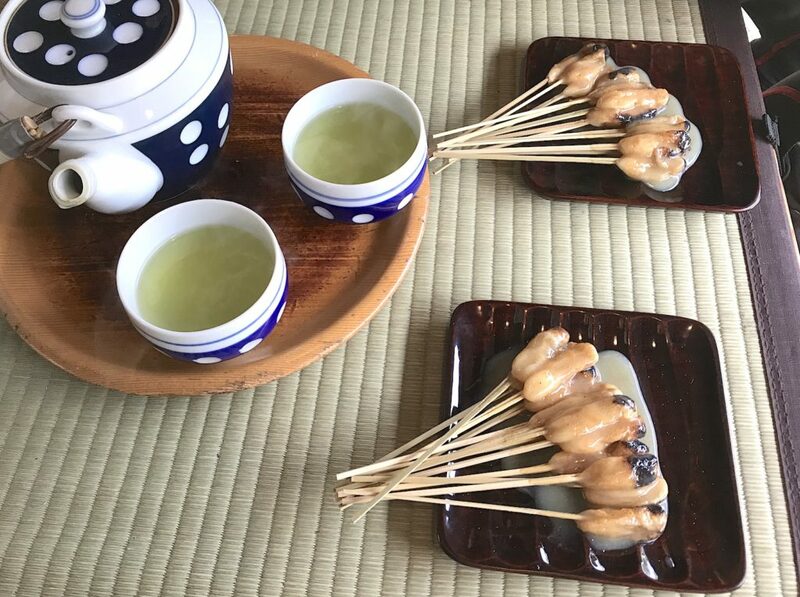 This traditional sweet dish consists of bite-sized mochi (sticky rice cakes) that are dusted with kinako (roasted soy bean flour) and grilled on bamboo skewers. Once toasted, they are coated with a white miso sauce and served warm with a pot of green tea. As well as being delicious, aburimochi is said to protect the eater from illness, so make sure you don’t miss out! Entry to the shrine is free. Both Ichiwa and Kazariya sell 15 skewers of aburimochi plus tea for ¥500. They are open from 10 a.m.-5 p.m., and close every Wednesday plus the 1st and 15th of the month (if those dates fall on a Wednesday, they will be closed on the Thursday). 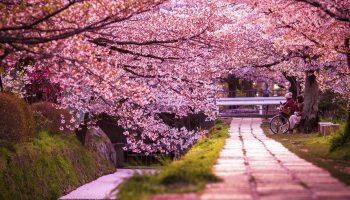 Take the Karasuma subway line to Kitaoji station and walk about 20 minutes west. The train from Kyoto station to Kitaoji takes about 15 minutes. There are also several bus stops nearby.